Replenished and firm skin is just a step away with the Innisfree's Skin Clinic Mask - Peptide. This fine delicate cotton mask with functional wrinkle improving benefits contains peptide to intensively reduce signs of aging, leaving your skin feeling sleek and resilient. Contains peptides and adenosine that helps with skin revitalization and skin firming. 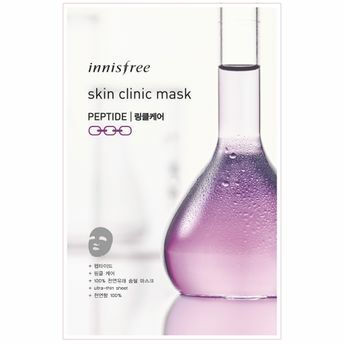 Additional information: Innisfree, the first natural brand from Korea, is dedicated to share the clean and pure energy of nature for healthy beauty. It shares the benefits of nature from the pristine island of Jeju, allowing for vibrant beauty and pursues an eco-friendly green life to preserve the balance of nature. Widely popular worldwide, this brand is creating spaces where nature and skin can rest in the green energy of pure Jeju. Explore the entire range of Sheet Masks available on Nykaa. Shop more Innisfree products here.You can browse through the complete world of Innisfree Sheet Masks .